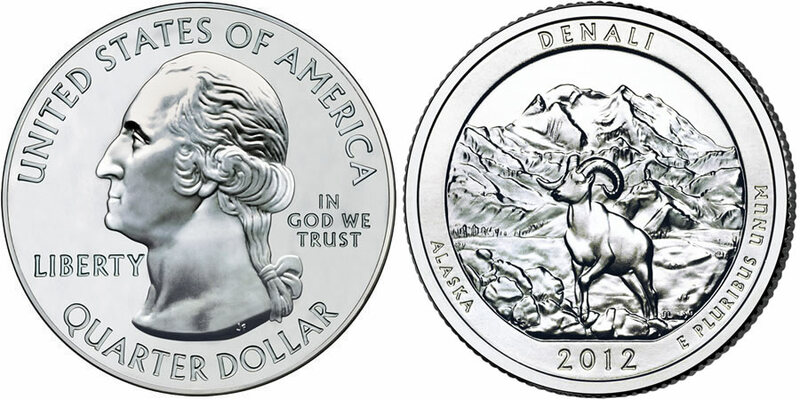 The 2012 Denali Silver Uncirculated Coin will be the last 2012-dated release of the US Mint's America the Beautiful Five Ounce Uncirculated Coin™ series. Shown on the reverse of the coin is a design emblematic of Denali National Park found in the state of Alaska. While the strike may be the last to appear in 2012 as part of the series, it only marks the fifteenth of a planned fifty-six to be released in the series as a whole. The program debuted in 2010 and will run until 2021 serving as the numismatic versions of the US Mint's America the Beautiful Bullion Coins. Both the uncirculated as well as the bullion coins are struck from five ounces of .999 fine silver with a diameter of three inches and featuring reverses emblematic of selected sites of national interest from around the United States, the District of Columbia and the five US territories. Denali National Park was originally established on February 26, 1917 as Mount McKinley National Park named after the massive mountain found within its boundaries. The park was later changed to the name of Denali to better reflect the wishes of the local people who knew the mountain as Denali. The inscriptions of UNITED STATES OF AMERICA, LIBERTY, IN GOD WE TRUST and QUARTER DOLLAR are showcased on the obverse along with a portrait of George Washington, the first President of the United States. Washington's image by John Flanagan was first seen on the 1932 circulating quarter dollar and has been in use on the quarters in one form or another ever since. Shown on the reverse of the coin is an emblematic image of Denali National Park including the likeness of a Dall sheep. Behind the sheep, the massive Mount McKinley is shown. Reverse inscriptions include DENALI, ALASKA, 2012 and E PLURIBUS UNUM. The reverse was designed by AIP Master Designer Susan Gamble and sculpted by United States Mint Sculptor-Engraver Jim Licaretz. An edge inscription can be found on each coin stating "999 FINE SILVER 5.0 OUNCE."